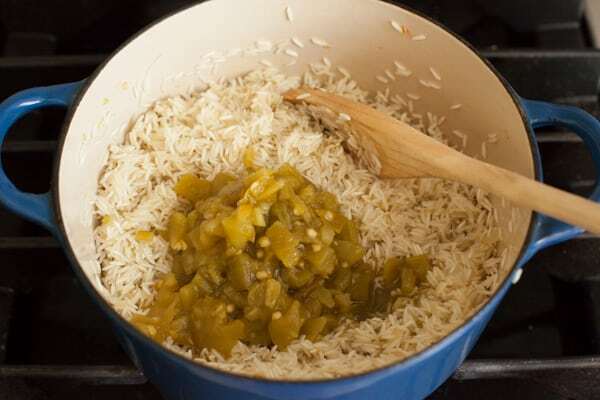 This Green Chile Rice has enough flavor to be a delicious side dish but is simple enough to be a great base for your next taco bowl or burrito bowl. 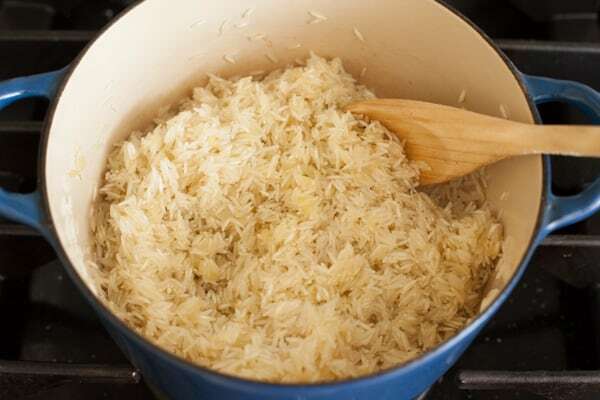 And if you’re tired of soggy, sticky, scorched, or clumpy rice, keep reading to discover my favorite techniques for a perfect pot of fluffy rice. Since the baby arrived, meals have been pretty strange around here. For the first month, I really had a hard time remembering to eat at all. That time period is a total blur now, but I know we were saved by friends and family stocking our fridge with food. I also know that those ready-to-drink protein shakes from Costco were a lifesaver for me. When Hazel was about a month old, I found myself back in the kitchen because I discovered that she was very content hanging out while I cooked. And when you find something that keeps a baby happy, you just keep doing that thing until it stops working. So I was cooking and baking a lot. There was bread, cookies, plum tarts, peach jam, plum jam, blueberry plum jam, more peach jam (so. much. jam. ), and more. Looking back at that time period, I have no idea where all that glorious energy came from. Next came the frozen food period. My energy was completely gone, the baby was no longer content in the kitchen or anywhere else, and she became so aware of the world around her that the tiniest sound from the opposite end of the house through a closed nursery door and over the sound machine would wake her from a nap. I swear sometimes the sound of my breathing would wake her up. The sound of my Boston Terrier breathing would definitely wake her up. I was afraid to even move a muscle when she was asleep, much less try to cook. But we needed to eat. So I did something I don’t think I’ve ever done in my life. I went to the grocery store and filled the cart with nothing but frozen meals. Thankfully, the frozen food period didn’t last too long. The convenience was nice (and necessary), but the food tasted terrible. And now I’m somewhere in the middle. Grocery shopping has been difficult and sporadic and I just haven’t found the time for meal planning. I am cooking again, but I end up just cobbling together whatever happens to be in the fridge and pantry, which is whatever I grabbed during the last mad dash through the grocery store with a baby who still isn’t sure how she feels about shopping with me. Hazel’s bath and bedtime routine happen right at the time we would normally eat dinner, so I’m not really cooking or planning big meals at night. I’ll usually get some kind of meat or beans cooked every few days along with some vegetables and/or rice or pasta, then hope it lasts for lunches and dinners until the next time I can cook. Our best meal of the day right now is breakfast. Phil hangs out with the baby in the mornings and I can do whatever I want in the kitchen. We always have fresh delicious eggs thanks to the chickens and I usually manage to keep our freezer stocked with homemade bread. And then there’s all the jam I made during the crazy cooking month. Yeah, breakfasts are definitely my favorite right now. But back to the rice. Last week I had a pound of ground beef to cook and I didn’t feel like doing anything much to it. I cooked it with with the last of my favorite homemade taco seasoning, figuring we could put it on some lettuce and call it a taco salad. But we didn’t have any lettuce. In fact, we didn’t have any vegetables at all. So I decided to make rice to go with the taco meat. 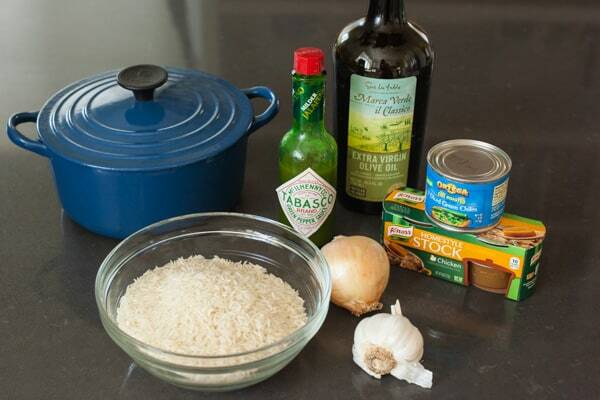 When I reached into the pantry for the rice, I noticed a can of green chiles that I didn’t even remember buying and decided that green chiles in the rice would be a good thing. It was. We liked it so much that I actually remembered to write down exactly how I made it so that I could test it again to share with you. So that’s what I did yesterday. Here are the ingredients for the rice. I used Basmati rice because during one of my pregnancy-related shopping binges I thought it was a good idea to buy a Costco-sized bag of Basmati rice. Basically we’ll be eating Basmati rice for the next year. The green Tabasco sauce was a last minute addition and I thought it gave the rice a great flavor, so I do recommend it. It’s also good in this zucchini recipe if you need another reason to get some. Although I do like to make my own chicken stock, it just isn’t happening much right now. Rather than use the the liquid store-bought broth, I like to keep these Knorr Homestyle Stock tubs in the pantry. This isn’t a paid endorsement, I just happen to think that it’s one of the better tasting store-bought chicken stock options. It’s way better than any of the liquid chicken broths or stocks I’ve tried and I think it tastes better than the jars of chicken base like Better Than Boullion. It does have a lot of sodium, so keep that in mind if that’s an issue for you. They apparently make a lower sodium version, but I haven’t seen it at my local store and I’ve never tried it. The little tubs of gelatinized stock concentrate make 3 1/2 cups of liquid stock, so I only use them when I’m making something that requires quite a bit of liquid. 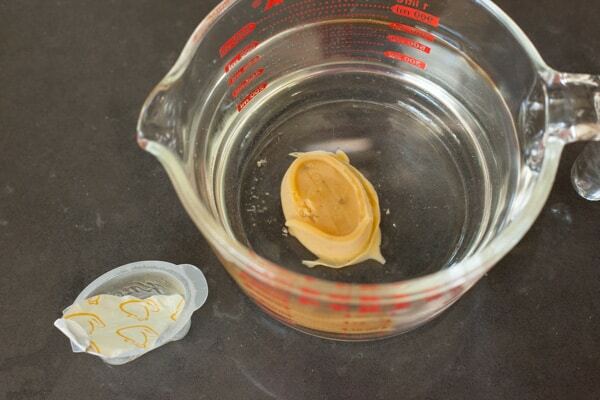 When I only need a cup of chicken stock or broth and I don’t have any of my homemade stuff in the freezer, I like to use the little pouches of broth concentrate from Trader Joe’s. The first thing you’ll need to do is chop up a small onion or part of a bigger one. I used about half a cup of finely chopped onion. 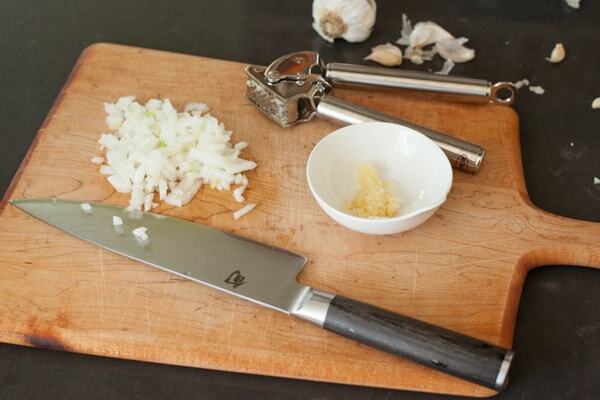 You can mince your garlic with a knife like I used to do, or you can use a garlic press, which is what I do since my husband brought home the best garlic press in the world. I’m seriously in love with this garlic press. Yes, it’s expensive, but I’m pretty sure Hazel will be inheriting it someday. I’ve bought so many cheaper crappy garlic presses over the years that I hated to use and hated to clean. I kept trying to find a decent garlic press because I get annoyed chopping garlic with a knife. It always sticks to the knife. Then it sticks to my hands when I try to clean it off the knife. Then my hands smell like garlic for three days. Ugh. But this garlic press works great and best of all it’s super easy to clean. If you don’t feel like spending the two seconds to clean it, you can throw it in the dishwasher. I love it. To reconstitute the chicken stock, I just fill up my big measuring cup with 3 1/2 cups of water, plop the stock in there, and put the whole thing in the microwave until it’s hot. After you heat it up, a quick whisk will bring it all together. 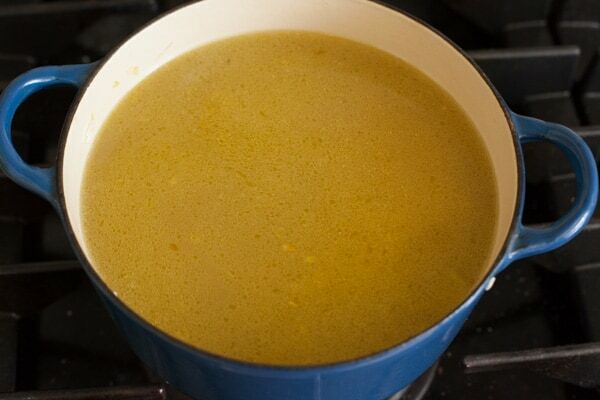 And if you’re using homemade stock or liquid chicken broth, go ahead and heat it up because it will speed things up when you’re making the rice. Heat the olive oil in a medium-sized pot. I wouldn’t suggest you buy a 2 quart Le Creuset dutch oven just to make rice, but this is one I inherited from my mom (it’s probably 40 years old) and it’s my favorite rice pot. 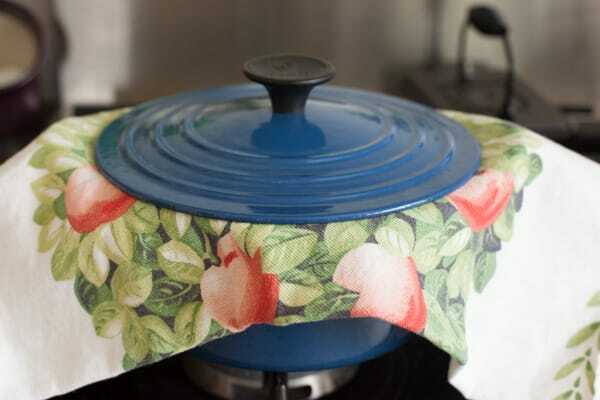 Any pot that holds at least 2 quarts and has an oven-safe lid and handles will work for this recipe. Once the onions have softened and you’ve stirred in the garlic to flavor the oil, add the rice and stir it around to coat it with oil. 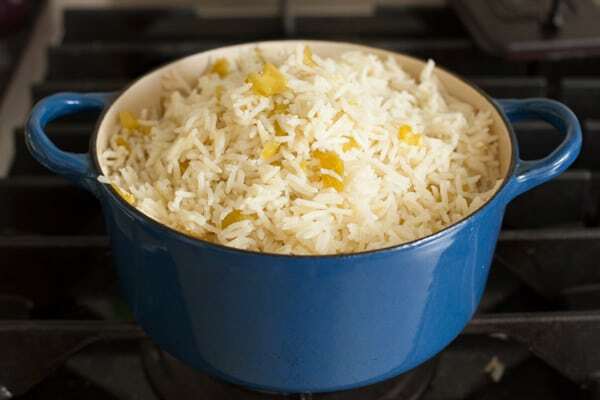 Turn up the heat and cook the rice in the oil, stirring constantly so that it doesn’t burn. You might hear it popping, which is totally normal. Just keep stirring for a couple minutes until most of the grains turn opaque. Next, stir in the chiles and tabasco. Then add the chicken stock. Turn the heat up again and bring the liquid to a simmer. If you’ve heated your stock ahead of time, this will be quick. If you haven’t, it will take a little while. You can do it either way. Make sure to stir the rice occasionally while it’s heating. Now here’s a little trick. Because I’m using exactly the amount of liquid necessary to cook the rice exactly the way I want it, I need to keep it all trapped in the pot. 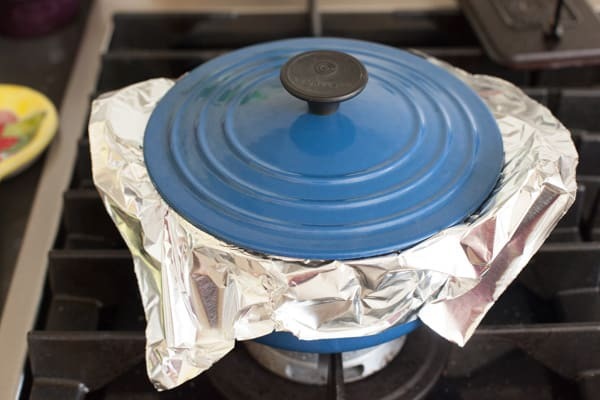 Putting a layer of foil between the pot and the lid creates a tighter seal. It really works great! My second trick is to cook the rice in the oven instead of on the stovetop. 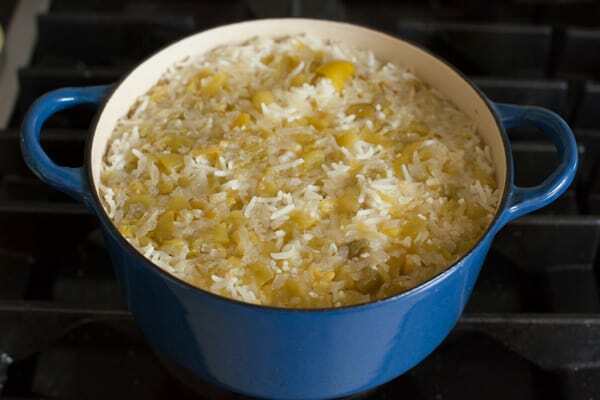 By cooking it in the oven, the rice won’t get scorched on the bottom, which can sometimes happen when simmering on the stove. Here comes the third trick. After twenty minutes in the oven, take the pot out, remove the lid, replace the foil with a clean dish towel, and put the lid back on again. Don’t put it back in the oven, just let the rice steam like this for an additional 10 minutes. The towel absorbs the extra steam and the results are perfect, fluffy rice. I can’t remember exactly where I learned these tips, but I think it was from an Indian cookbook. Anyway, it works. 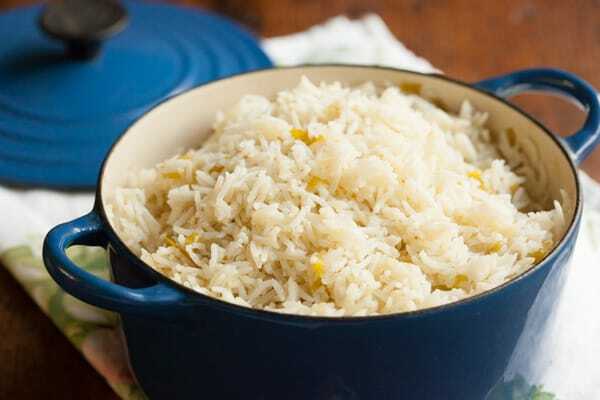 After ten minutes, remove the towel and lid and fluff the rice with a fork. It’s ready to eat! 2. Heat olive oil over medium-low heat in a medium sized dutch oven or oven-safe pot. 3. 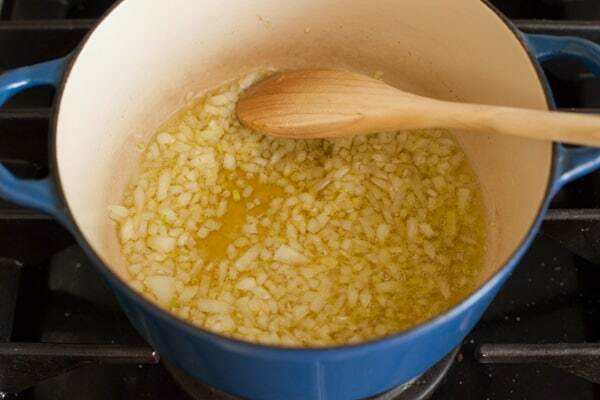 Add onion and cook, stirring occasionally, for about five minutes, then stir in garlic. 4. Add rice and stir to coat the grains with oil. 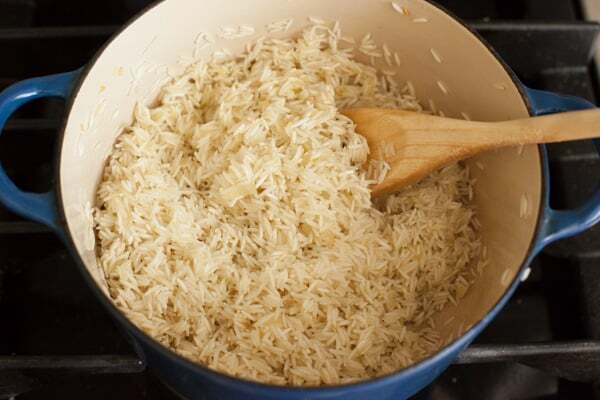 Turn heat to medium and cook the rice in the oil, stirring constantly, until most of the grains turn opaque, about two minutes. 5. Add chiles, green Tabasco, and chicken stock and stir to combine. 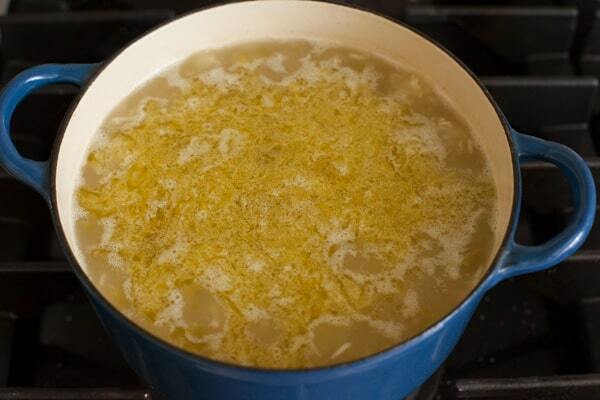 Turn heat up to medium-high and bring the mixture to a simmer. Remove from heat, cover pot with a piece of aluminum foil then the lid and move the pot to the oven. Bake for 20 minutes at 350 degrees. 6. After 20 minutes, remove rice from oven, remove the lid and foil (don't stir yet), replace foil with a clean dish cloth and put the lid back on top of the cloth. Let sit for 10 minutes. 7. Remove lid and towel, fluff rice with a fork, and serve. 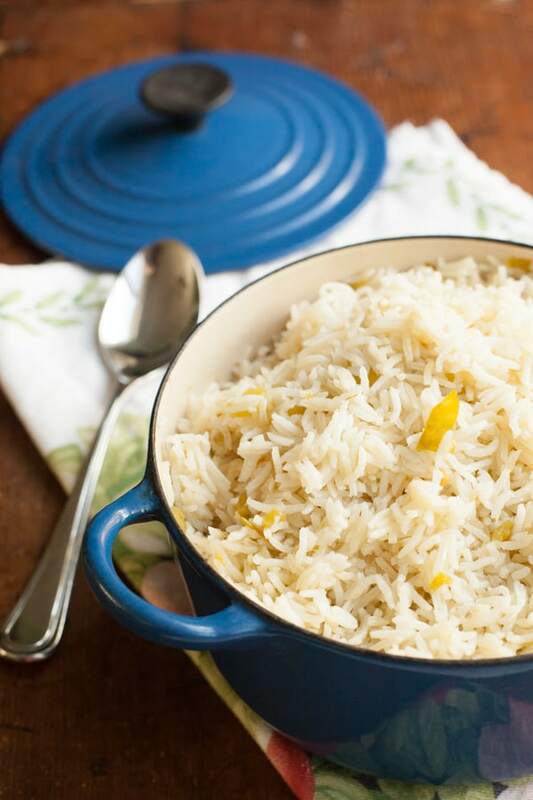 I used Basmati rice in testing this recipe because that's what I happened to have in the pantry. Regular long grain white rice would be fine or even Jasmine rice if that's what you have. 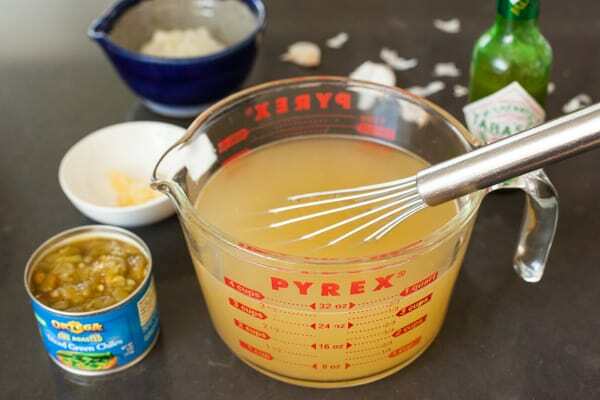 If you are using low sodium chicken broth or homemade, unsalted broth or stock, you'll want to add about 2 teaspoons of salt. If using the Knorr homestyle concentrated stock shown in my photos, you won't need to add any additional salt at all. The green jalapeño Tabasco sauce is optional, but I think it adds a nice flavor. 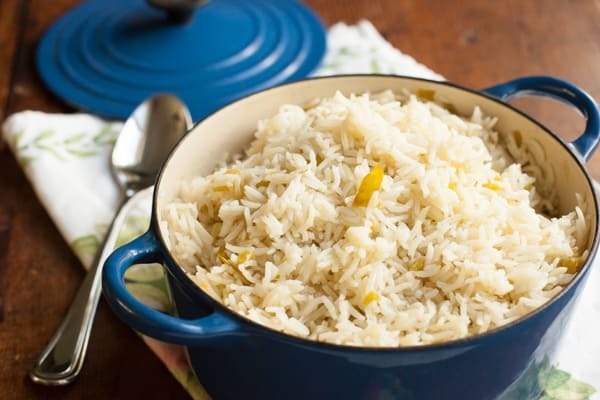 I prefer to cook most of my rice dishes in the oven because it prevents scorching the bottom of the rice, but If you'd prefer to cook the rice on the stovetop, just turn the burner down to the lowest possible heat after it comes to a simmer and let cook, covered, instead of moving it to the oven. The timing and techniques should work with either method. This post was not sponsored in any way by the brands I’ve mentioned or photographed, but it does include Amazon affiliate links. Making purchases through these links won’t affect the amount you pay, but I will earn a small percentage, which helps support this blog and my family. If I write about products I have received for free or am ever paid to write about a product, it will always be disclosed. Thank you. 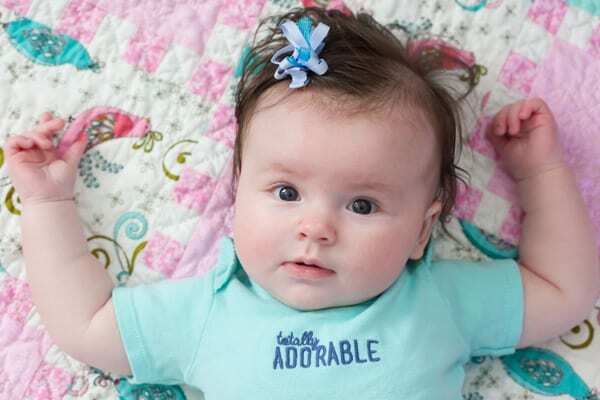 Your baby is about the cutest thing EVER! Good for you for putting something so tasty on the table with a tiny baby to take care of! Your baby is so adorable! This recipe looks great! I love rice and chilies so this is speaking my language!!! She's so pretty!!! Love the rice, too. Chopped green chiles are a staple in my pantry!